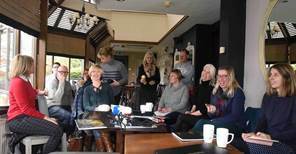 Towards the end of last year, SGD Cheshire garden designers enjoyed a cup of coffee whilst finding out a little more about professional, outdoor garden lighting techniques. Lighting for Gardens technical director Philip Milner was invited by Dawn Perkins (RCO NW SGD) to lead a seminar at Mere, in Cheshire. Phil focused the debate on lighting individual garden features, rather than a football pitch approach and was on hand afterwards to answer any installation related questions. 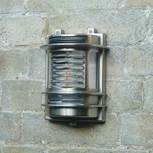 Some of the latest, solid brass, outdoor wall lights were also on display. The weight of the Dartmouth outdoor wall light stunned everyone – a solid brass LED fitting weighing in at nearly 2.5kgs!